Igalo is a small town in the Herceg Novi municipality of Montenegro. It is accessible via the E65/E80 north headed to Dubrovnik, Croatia. It has a population of 3,754. The town adjoins Herceg Novi and is administratively divided leaving no clear division between the towns. Located on the slopes of Mount Orjen, Igalo is regionally famous for the “DR Simo Milošević” Institute, a Mediterranean themed health spa which formerly attracted many tourists. Architect Aleksandar Đorđevic built this Institute. The institute is one of the unique hospitals and spas in the Balkans. Though the effects of the Yugoslav Wars limited Igalo’s attractiveness as a tourist destination, it nonetheless remains a popular resort for tourists from the surrounding region. Former Yugoslav leader Tito had his summer villa in this town. This villa was subsequently used to host the last meeting between Slobodan Milošević (then President of Serbia) and Franjo Tuđman (then President of Croatia) amid the early stages of the Yugoslav Wars and fighting between Serbs and Croats throughout Croatia. Igalo’s allure and tourist development has always been fully based on the natural healing properties of his sea mud. Because of the adjacent location of Herceg Novi, which is within walking distance of each other and is easy to walk on the sea promenade Setaliste pet danica, the larger investors have chosen to invest in the larger projects. This means that the tourist growth in Igalo has mainly increased in the accommodation forms of apartments and holiday homes. The “DR Simo Milošević” institute has its own hotel for receiving guests. It offers a unique and almost nostalgic experience of the communist luxury and determines the street scene of Igalo. Montesun Residence – Montesun Residence is just a 10-minute drive from the border with Croatia. It offers air-conditioned apartments with a private balcony. The coast is 20 meters away, on the other side of the street. The bright apartments at Residence Montesun have a seating area with flat-screen TV and modern kitchen with all necessary kitchenware. The hotel is 200 meters from the restaurants and nightlife of the busy Pet Danica promenade that stretches for 7 km along the coast. The front desk at the Montesun Hotel is open 24 hours a day. The hotel offers a cash machine on the ground floor and an airport shuttle service. Facilities : Free Wi-Fi, Terrace, Garden, Balcony, Garden furniture, Wake-up service, Sea view, Laundry (surcharge), Airport shuttle. Apartments Marina – This property is a 1-minute walk from the beach. Just 20 meters from the spa facilities in the Mediterranean center, Apartments Marina offers free Wi-Fi and free parking. Nearby is a restaurant and a bus stop and the center of Igalo at 200 meters. Air conditioning and a private bathroom are provided in all rooms and apartments at the Marina. There is a restaurant next to Marina Apartments and you can shop for groceries just 15 meters away and the nearest bar is less than 50 meters away. The Old Town of Herceg Novi is about 3 km away. Facilities : Terrace, Garden, BBQ facilities, Free Wi-Fi Internet, Free Parking, Airport Shuttle (surcharge), Private Entrance, Garden View, Tea / Coffee Maker. Apartmani Ilic – This property is a 4-minute walk from the beach. 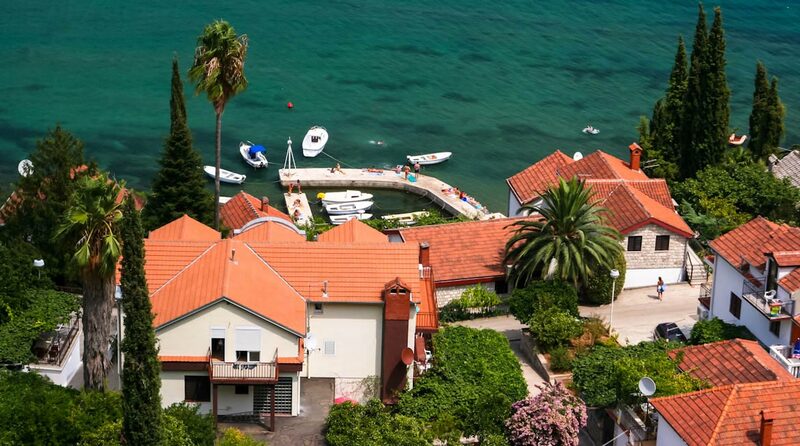 Featuring a garden and a terrace, Apartmani Ilic offers accommodation in Herceg-Novi with free WiFi and sea views. This apartment offers air-conditioned accommodation with a balcony. This one-bedroom apartment features a kitchen, a seating area and a flat-screen TV with cable channels. The apartment also offers a bathroom with a shower. Facilities : Terrace, Garden, BBQ facilities, Free Wi-Fi Internet access, Free parking, Airport shuttle (surcharge), Private entrance, Garden view, Tea / Coffee Maker, Pets allowed, Terrace, Balcony, Garden.